After sorting and reorganizing my punches, I was ready to actually use one for a card. 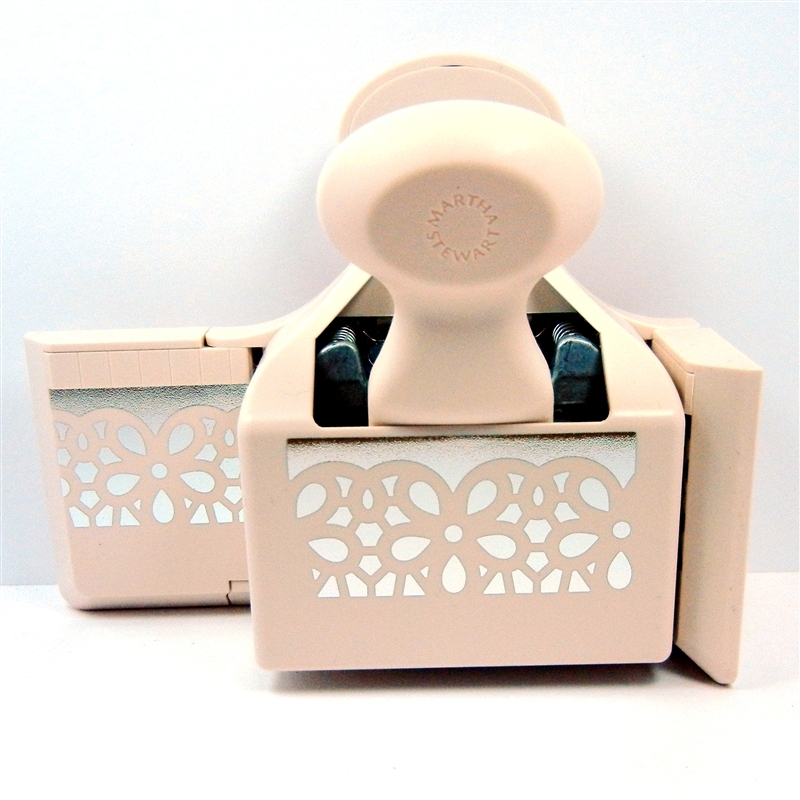 I pulled out one of the most recent additions, the Daisy Lace deep edge punch. These deep edge punches are some of my favorites. 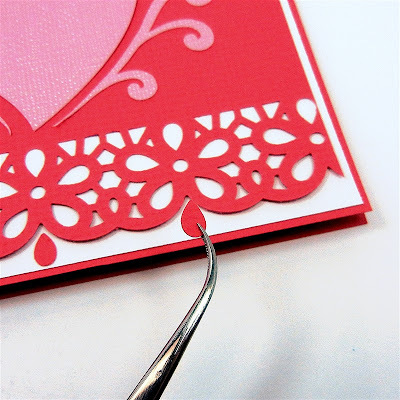 They add so much detail to a card and are quick and easy to use. 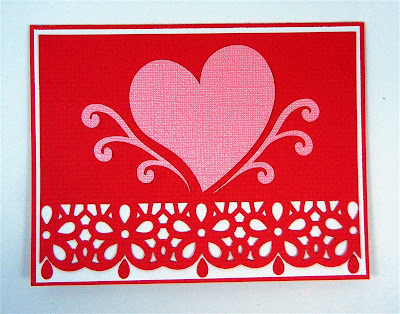 I could design a similar border for one of my die cutting machines but it would take a while for it to cut so many small details. I had the leftover hearts and swirls from this gift bag sitting on my table, just waiting to be added to a card or some other project. (This bag is one of the free cuts that came with my new Silhouette Cameo machine). 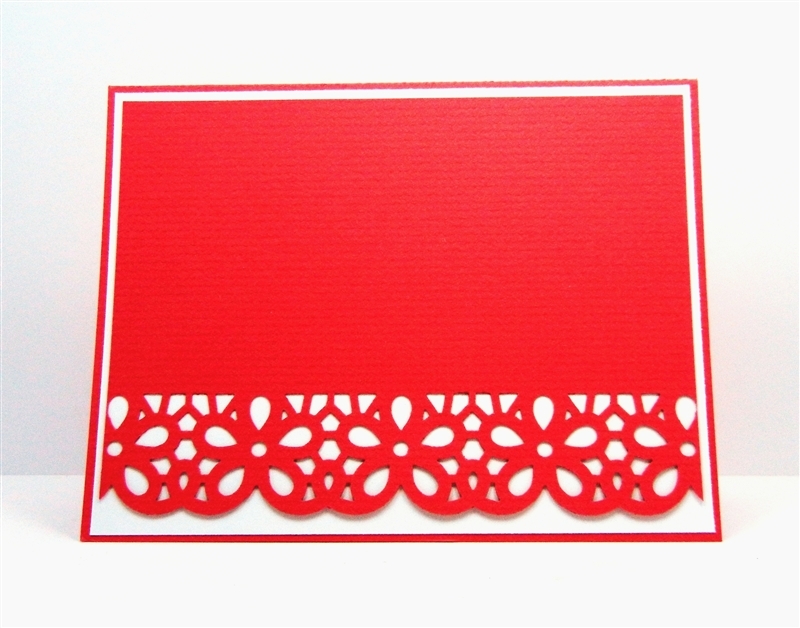 This is a standard A2 card (8 1/2 x 5 1/2 folded to make a 4 1/4 x 5 1/2 inch card). 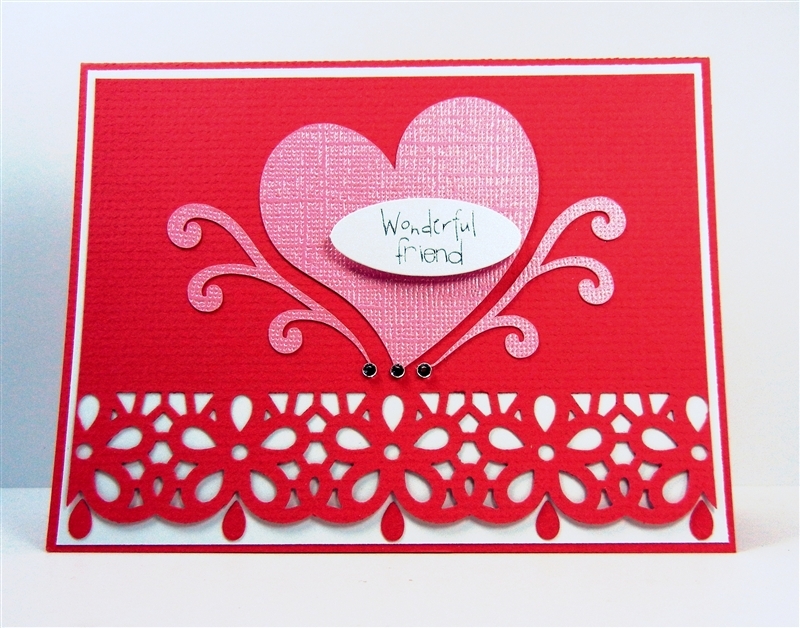 I cut the card base from Bazzill textured cardstock in a rosy red. 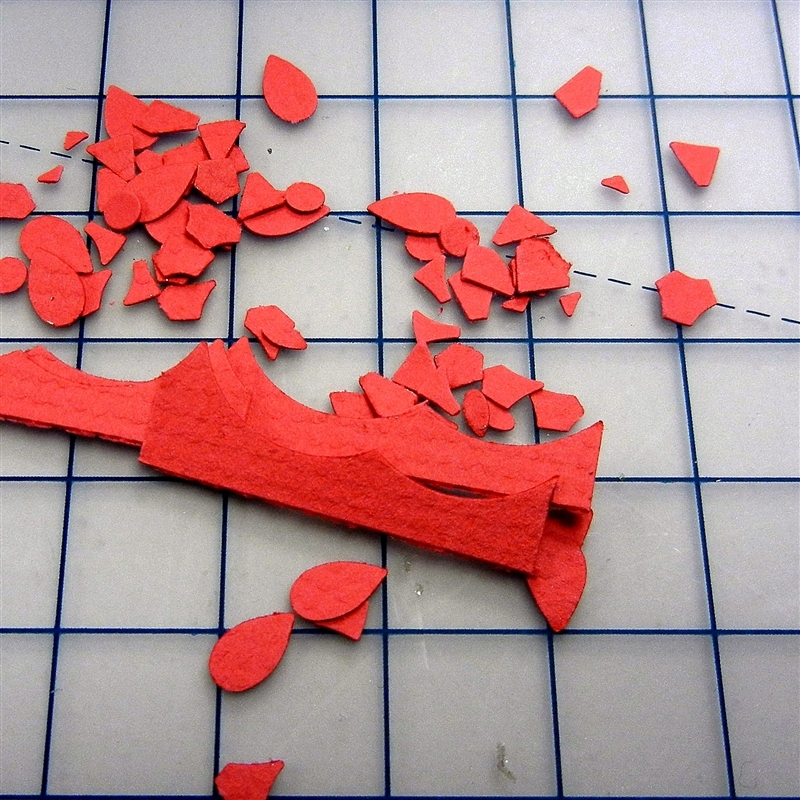 The top layer is 4 x 5 1/4 inches, also from the red Bazzill cardstock, punched along one long edge. It is important to center the punch to get a nice symmetrical look for the card. The white layer is 4 1/8 x 5 3/8 inches. The punched top layer is adhered in the solid section but the lace part is not stuck down on the white layer. These little bits were left from the punch. I noticed the flower petal teardrop shapes and thought they would make a nice addition to the border so I pulled out five of them. I added the pink heart cut and the thin swirls along the sides. 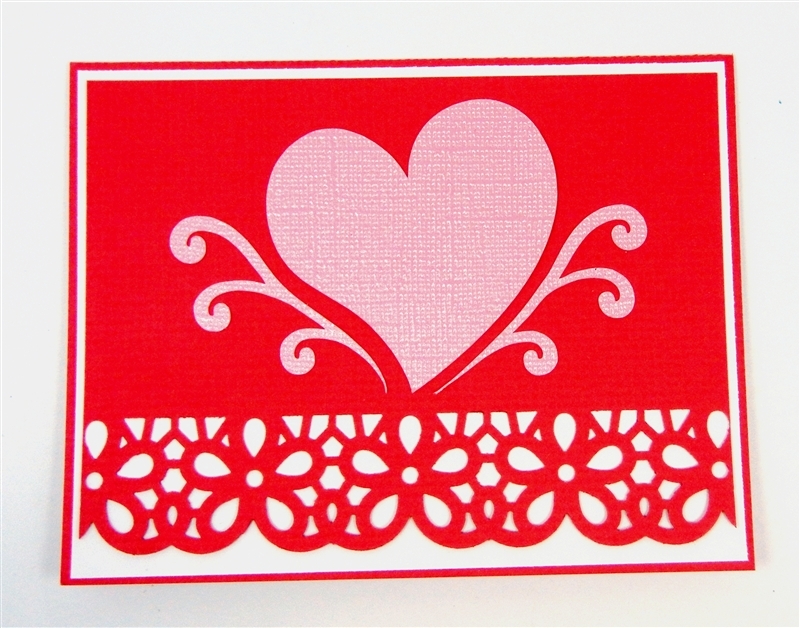 The heart is cut from Core'dinations gemstone cardstock and is textured with a pearly shine. I used Creative Memories Precision Point adhesive for the swirls and the tiny teardrops. I let it dry to clear and then it is sticky but won't ooze out from behind the tiny pieces when they are placed on the card. 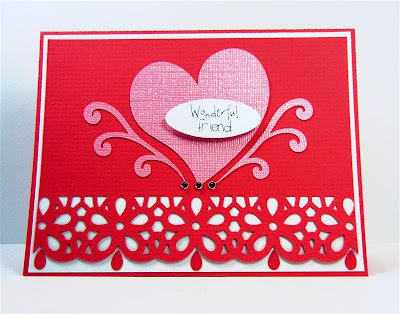 The extra little teardrops make the border a bit more dramatic and fill the space nicely. I added foam squares to lift the oval sentiment tag. This is one of the Craftwork Cards sentiments that my friend Enfys gave me. They are so handy and work well for quick cards. 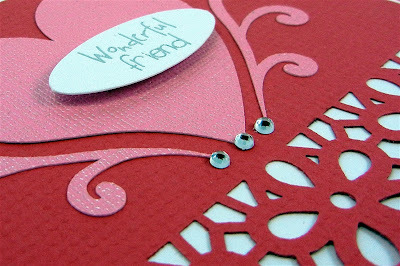 Three tiny clear gem stickers from Creative Charms are just right to finish the base of the heart and the swirls. This card is quick and easy to make. 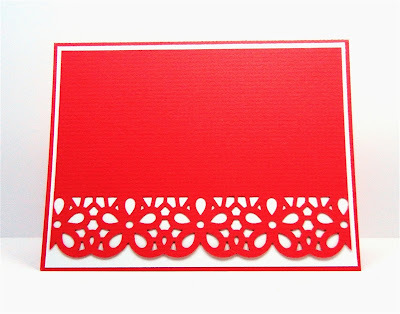 If you don't have this particular wide border punch, there are lots of others that would also be pretty along the lower edge. 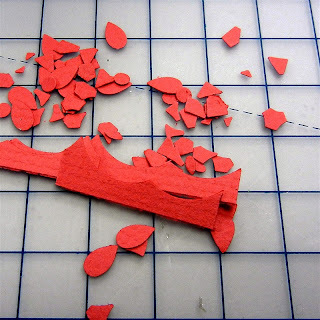 I think it is important to always look at the scraps and leftovers from one cut to see if they can be used for another purpose. I love the early morning posts! I missed you yesterday and thought blogger must be experiencing difficulties. As a teacher, I always check at around 5:00am. If I wait until the end of the day, I have "classroom" sites I visit instead of "me" sites! Thanks for all the great tips and inspiration! Good morning! 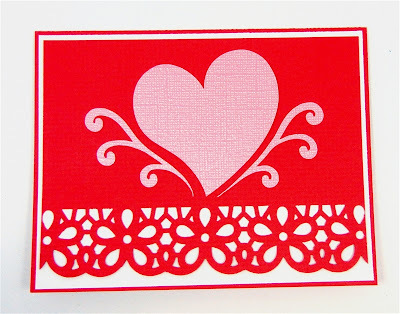 I love your card, absolutely beautiful! I love starting out in the A.M. with a cup of coffee and reading your blog...it's a great dose of motivation! Thank you for always sharing your knowledge and creativity! 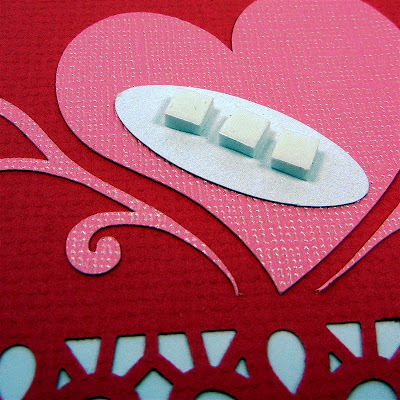 Love the valentine card! I dont comment often, but always look forward to reading your blog in the morning. Thanks so much for sharing all your knowledge! Happy New Year! Hi Diane, I am an email subscriber and I always look forward to your posts. I love your designs, tutorials and your product reviews. The timing of your posts does not matter to me. i read my emails in the morning and check again in the evening. I also really enjoy your photos. Love the early morning Emails. After I read the paper, have my cup of coffee, I go directly to my computer and read your lovely notes. TFS. Early morning is when I read most of my emails, but since I'm retired I check my computer all day. I enjoy your posts so much, so whenever is best for you works for me. 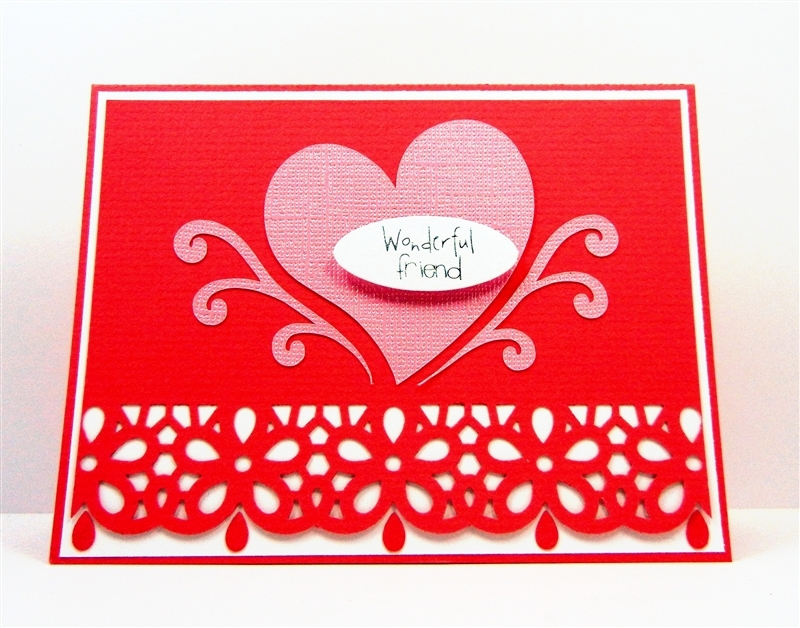 Pretty card, I like how you added the teardrop shapes. I read your blog every day, sometimes in the morning sometimes at nite, all depends on when I have the free time. So whenever you post is fine with me. Whatever works best for you. I love the early morning posts, as I always look at my favoirte blogs while I drink my morning coffee. You all provide so much inspiration! Thank you! I subscribe by email and enjoy reading your blog with my morning coffee. Thank you so much for the time you spend providing us with so much inspiration. I also enjoy the photos you post of such interesting subjects. Thanks for a job well done. 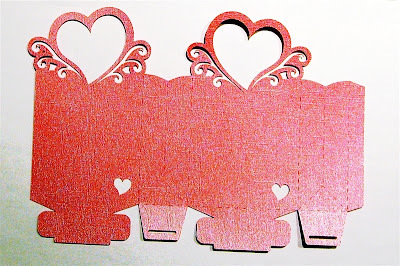 I'm going to have to start saving the confetti that I get when I use my punches... those little teardrops really do add something special to your card! For my part, I really enjoy getting your blog posts in my morning email. I am subscribed to several blogs, and so I sit and get my daily crafty-blog fix with my morning coffee. Thanks for getting the twitter link working. I click on the link as soon as I see it on twitter, but any timing works for me. I like your new blog, too. I don't suppose you could make that link on twitter...? If not, I'll just look occasionally. Is your Daisy Lace Deep Edge punch a Martha Stewart punch? Love that card and all the extra bling. I don't subscribe by email, but your site is the one bookmarked on my computer that I check every day. I ALWAYS look forward to seeing what you've posted. I usually check in the morning, but if I don't have time to get on the computer in the morning, I for sure check your site later that day. Wonderful card, Diane. Love how you used the teardrops. They are perfect! I just read the e-mails whenever they come. It doesn't matter to me ;- ) TFS! I love your card (actually I love all of your projects!). I don't always get to read my email when I want to, so the time of the post isn't all that critical for me. I used to not receive posts until 24 hours after it was submitted, but I have changed my email address to a new provider and I now get them much quicker. Love that you used the leftovers. I alway feel bad tossing them. You really make me want at Cameo machine. Love the valentine and this box looks wonderful. I hope you show it put together. I do not have a posting preference. 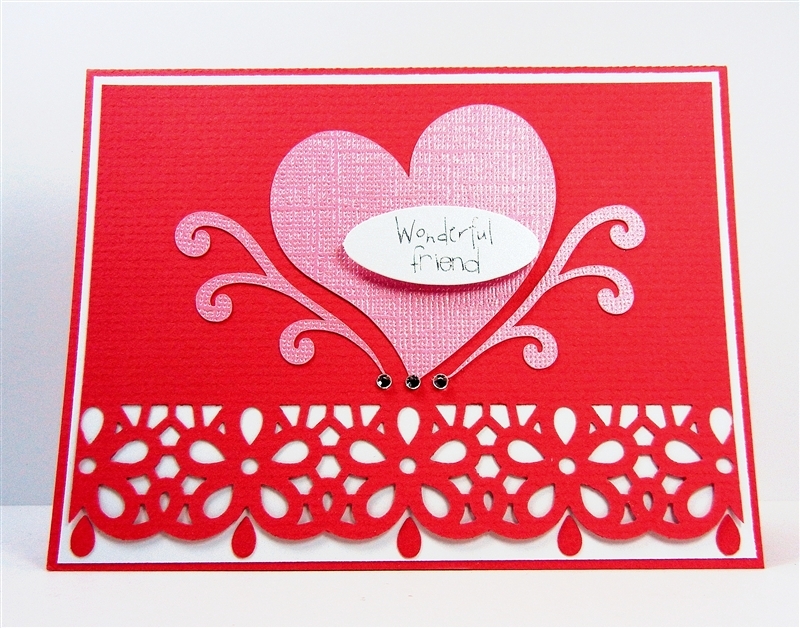 I just enjoy looking at what you create since you are quite different from the other card-making sites. You are way more talented with the camera and computers...which leave me totally confused. Just good to see a talented woman who is willing to share her knowledge with others. A simple but very elegant card. I too like to find uses for the extra little tidbits. I work in health care so I go to work either at 5 or 7 am. I check my email in the afternoons unless it is my day off then I check earilier. I am a very early bird person (4:30 EST). I enjoy having my cup of coffee reading your blog; just before heading out to work with my precious preschoolers. I always enjoy your posts - and look for them early morning with my coffee. However, if one is not there, I check back later in the day. Thanks for all the detail in your posts - I have learned so much from you.